Chesapeake Urology’s Infusion Therapy Center is a state-of-the-art facility designed for a superior patient experience. 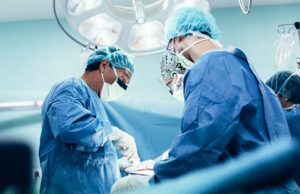 The dedicated and experienced treatment team at Chesapeake Urology’s Infusion Therapy Center understands that expert care coupled with compassionate support can put your mind at ease when beginning infusion therapy for your advanced prostate cancer. The Infusion Therapy Center team includes physicians who are present during all infusions to provide medical oversight for treatments, a center manager and dedicated infusion therapy nurses. The Infusion Therapy Center is a warm, open environment with five personal infusion areas designed for comfort. 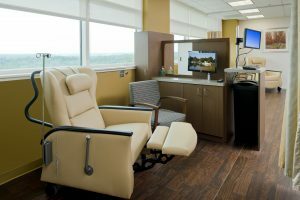 Reclining chairs and TVs in each infusion area add to the experience and comfort of our patients and the bright space is filled with natural light streaming in through walls of windows. Our staff also encourages support for wives and caregivers. We understand that advanced prostate cancer and treatment can also be emotional for spouses and partners, which is why our staff helps connect caregivers for additional support. It’s all part of the holistic and compassionate approach to cancer care that is the hallmark of Chesapeake Urology care. Learn more about Chesapeake Urology’s state-of-the-art Infusion Therapy Center and our comprehensive advanced prostate cancer program on our Prostate Cancer website.